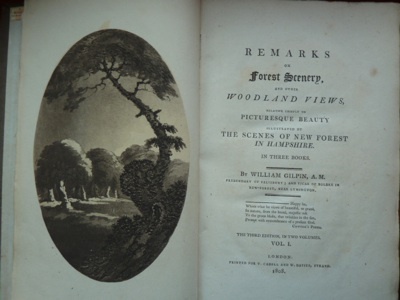 Amongst the books in our library is a small collection of works dating mainly from the end of the 18th century, which prescribe (to discerning tourists) where to go and what to see on arrival, in order for a proper appreciation to be had of those aspects of the natural scenery that constitute its most sublime and picturesque features. 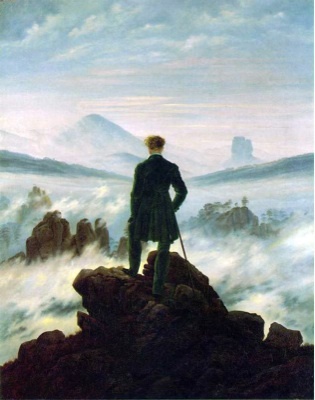 We are talking here of the romantic period, when sensiblities had been heightened by Gothic novels set in crumbling castles, by lyrical ballads extolling the divinity of nature and by Byronic heroes exploring far away lands in cantos spanning many volumes. There was also a leisured class eager to satiate this heightened sensibility by exposure to the best that nature had to offer. 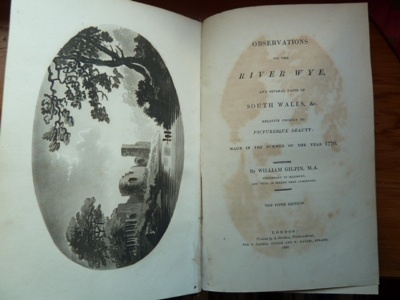 It may seem strange that appreciation of landscape had to be taught, but that is exactly what happened, through the works, in particular, of Uvedale Price and William Gilpin, the much travelled Vicar of Boldre in Hampshire. 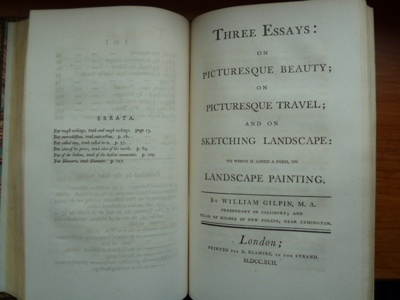 The former wrote "Essay on the Picturesque, as Compared with the Sublime and the Beautiful" (1794), while the latter's principal theories were summarised in "Three Essays: on Picturesque Beauty; on Picturesque Travel; and on Sketching Landscape" (1792). 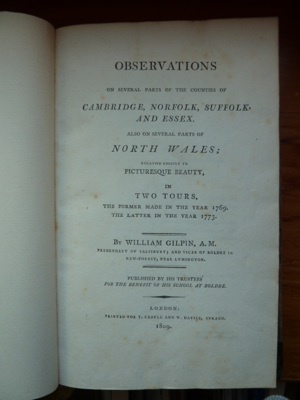 Prior to this, Gilpin had made a series of tours across Britain, interpreting the scenery and pointing out those elements of the landscape that most typified the picturesque. Under Gilpin's tutelage, our attention is drawn to those features that are essential to a really good landscape, such as stunted trees, romantic ruins and contracted valleys. 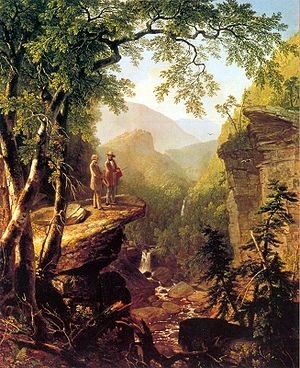 The paintings of Salvator Rosa are held up as prime examples of how art can improve upon nature and under Gilpin's influence landscape artists of the time were encouraged to adjust the view to better fit the ideal. So much that is picturesque, so little time! But help is, fortunately, at hand. 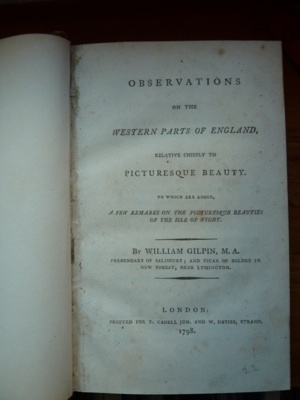 Recognising that the already over-burdened leisure classes would not have the time to actually read Gilpin and plan their own tours of the picturesque, Thomas West did it for them! 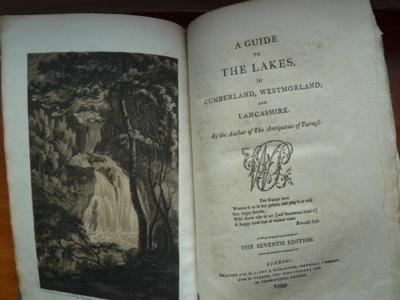 In his classic "Guide to the Lakes", which ran through many editions between 1778 and 1821, West identified 'Stations', from which the views combined the best elements of picturesque landscape and at which the aesthetic sensibilities of the tourists would be most heightened. So, all the traveller had to do was arrive at a conveniently sited Thomas West station and look at the view, confident that however hard he tried, he would not find one finer. To make it even easier, buildings were erected at some of the stations, so that the intrepid tourist would not suffer the indignity of getting wet whilst communing with savage nature. 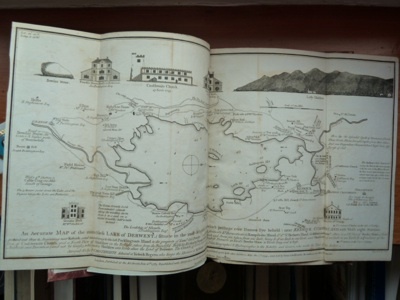 Recognising the commercial possibilities of all of this, the enterprising owner of the Keswick Museum, Peter Crosthwaite, in 1794 published a set of maps that could be purchased as a companion to Thomas West's guide. These maps identified West's stations and, for good measure, Crosthwaite added some of his own. The maps were embellished with engravings of some of the principal features that should be noted, just in case our romantic tourists had still missed the point. 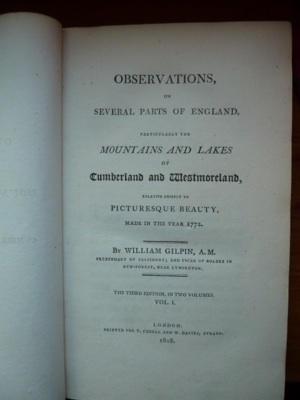 I trust that, following a careful read of Thomas West our diligent travellers noted also the progression from 'the delicate touches of Claude, verified on Coniston lake, to the noble features of Poussin, exhibited on Windermere-water; and from these, to the stupendous, romantic ideas of Salvator Rosa, realized on the lake of Derwent'. Moving on some 200 years, some of the views from West's stations are apparently now obstructed by trees. 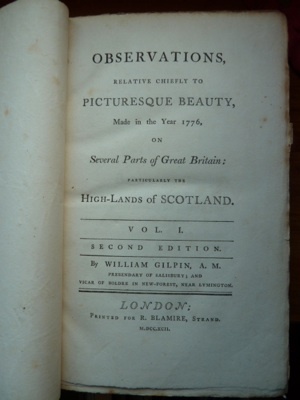 However, our modern day quest will be to get as close as we can to each station, so that, with Thomas West's words to hand we can share the experience of the picturesque with those intrepid eighteenth century travellers. We are helped in this quest by the new science of geocaching, since a fellow cacher called 'flipflopnick' has obligingly worked out the co-ordinates of the stations and made them available on the geocaching web-site. So we will not need a local guide, just a GPS. Our search in quest of the picturesque in accordance with the above method will be described in future postings.